Back to school time can be a hectic time for both kids and parents. Here are two of our recently updated information sheets for parents to help ensure the school year gets off to a great start! When it comes to parent advocacy in education, there are important considerations: the long-term working relationship between you, as a parent, and the educators who have a continuing role in your child’s educational development, and how that relationship may affect your child’s educational environment. Continue reading . Find more of our resources at www.askresource.org/resources . RESPECT is a free, four-day workshop focused on training participants in relationship building and conflict resolution. The skills and strategies taught at this training can be applied universally when addressing professional and personal conflict. 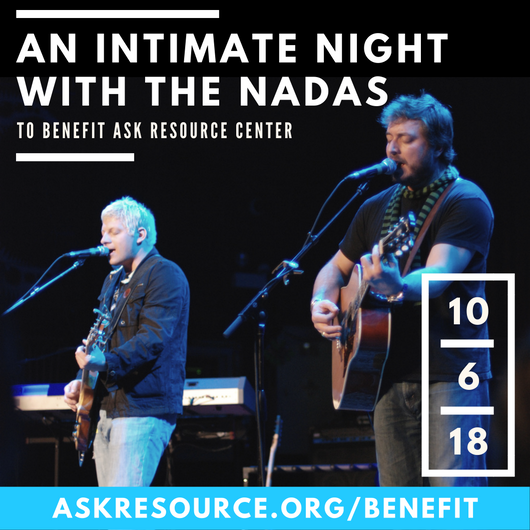 Raise Funds and Have Fun with The Nadas on October 6! Join us for live music and drinks under the night’s sky to benefit ASK Resource Center! Individual tickets are $75 per person, and a reserved table of ten is $650 (a savings of $100). Unable to attend the event in person? Make a tax-deductible donation at www.askresource.org/benefit. The contents of this listserv email were partially funded by grants from the US Dept of Education, #H328M140017 and the US Dept of Health & Human Services, #H84MC24065, and a grant from the Wells Fargo Foundation. ﻿These contents do not necessarily represent the policy of those entities, nor should one assume endorsement by them. ASK Resource Center serves as a Family Voices State Affiliate Organization, and is a member of the Parent to Parent USA Alliance.